This document will provide a general overview of how to backup and archive your UH email using Microsoft Outlook 2007 on a Windows based PC. The first step to creating a backup of your email is to clean up its contents. Delete all email that you do not need or do not wish to have a backup of. Especially delete emails with attachments that you no longer need, to save disk space. The next step is to organize the emails you wish to backup into folders. 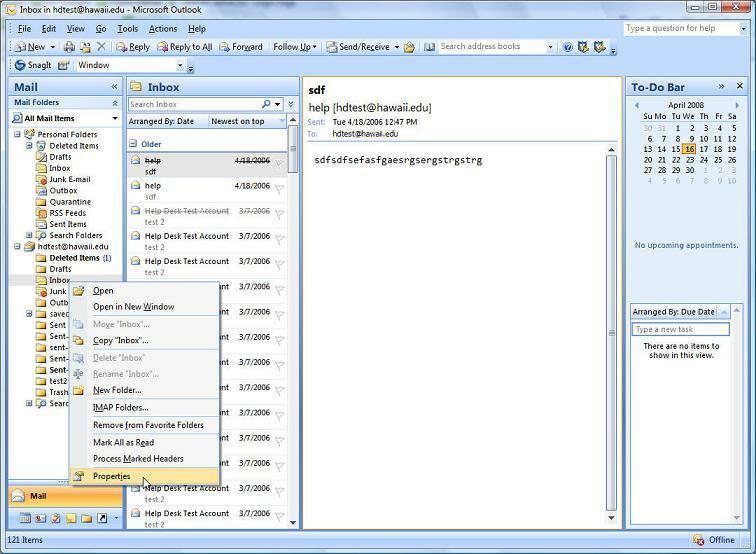 You can create multiple folders to store related emails in one place. Organizing your email in this way will make it easier to restore the emails you may require at a later date. 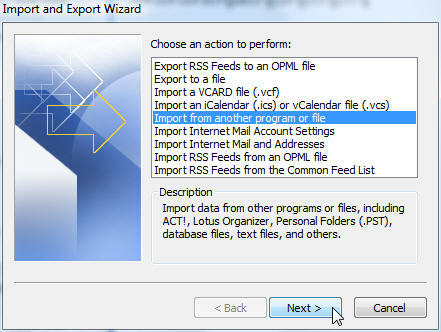 In the window that opens, choose the option Export to a file from the list of actions. Then click on the Next button to continue. 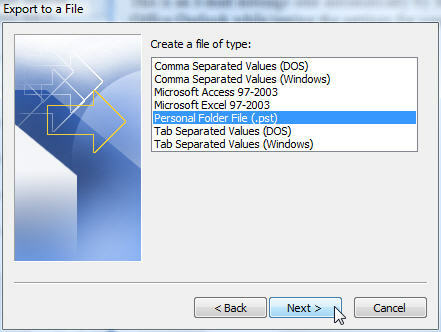 In the Create a file of type box, select Personal Folder File (.pst) and click the Next button to continue. In the Select folder to export from box, select the folder you wish to make a backup of. 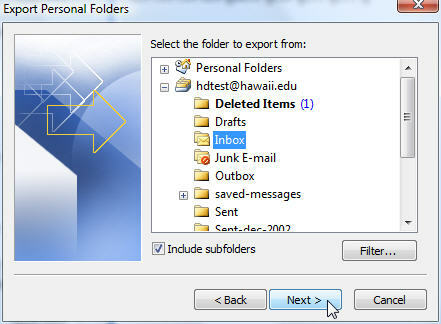 In the Figure below, the folder named Inbox was selected. Check Include subfolders if the exporting folder contains subfolders. Also the filter button allows a wide range of choices to export only certain messages within the folder. Click on the Next button to continue. In the next window that opens, Outlook asks for a location to save the exported file. Click on the Browse button to change the default location. Choose an easy to remember location, or save to your desktop for easy access if it will be stored on removable media (e.g. flash drive). Be sure to give the exported file a descriptive name. In the Options section, choose the most appropriate option for your needs. Then click on the Finish button to continue. A new window will now open, asking you to create a Microsoft Personal Folder. 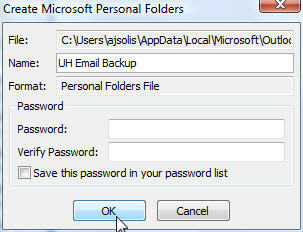 Give the folder a descriptive name, such as UH Email Backup as in the sample figure below. Enter a password if you would like to password protect the file from other users. That’s it. You have just created a backup of the selected email folder. 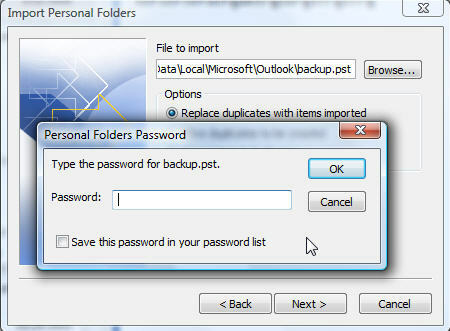 You can repeat this process to backup other email folders if you wish. To free up disk space and your quota, you may delete the messages you backed up, or move them from your IMAP folder to your local hard drive. 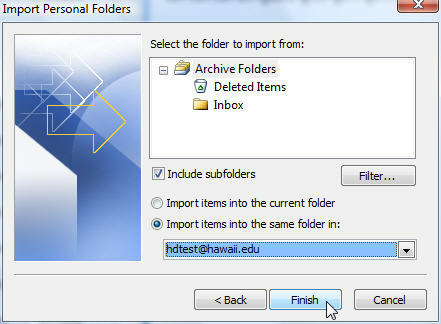 See the section Techniques to Reduce Email at http://www.hawaii.edu/askus/502 for instructions on moving messages from an IMAP folder to a local folder. At some point in the future, you may want to restore your email from one of the backups you made. In the window that opens, select to Import from another program or file. Click on the Next button to continue. In the following window, scroll down the list of file types and select Personal Folder File (.pst). Click on the Next button to continue. Next, click on the Browse button to locate the Personal Folder File you wish to restore your email from. Select the appropriate option for your purposes. In this case, a backup.pst file was created during the backup process earlier in this document so that is the file that will be restored. Click on the Next button to continue. If you created a password for the pst file, enter it to open the file. Then click on the OK button to continue. Note: you will not receive this dialogue box if you did not create a password. Next, select the folder you want to import from. If the folder you backed up had subfolders, you may select just the subfolder to restore. You also have two options on where to import the folders to. You may choose to import the items into the currently selected folder (highlighted in the Navigation Pane), or into the same folder that’s already created in your email account. 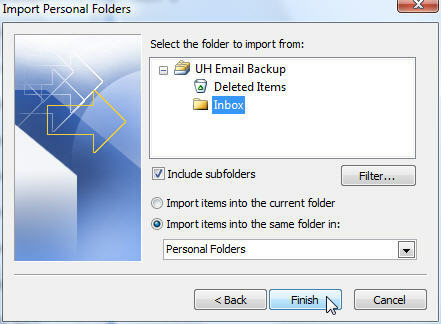 In the figure below, the option was selected to restore the email into the same folder in the Personal Folders (Inbox). Since it is going to the Personal Folders it will not be stored on the UH server where it would consume quota. That’s it. 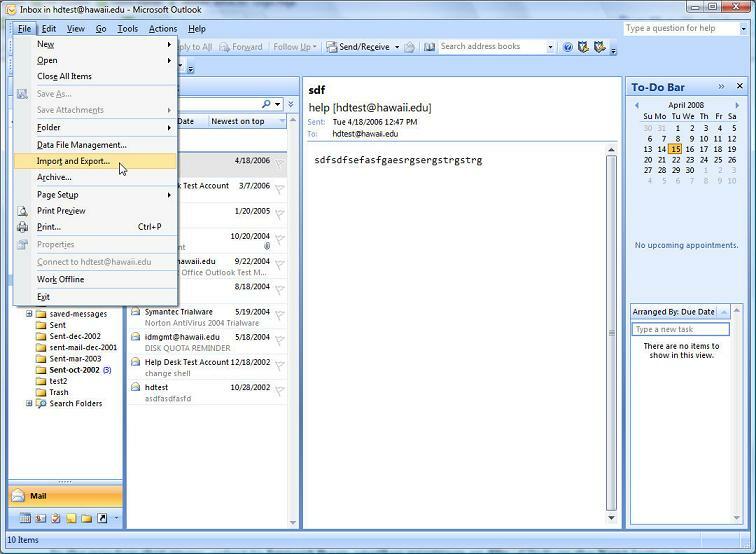 Outlook will import the email messages from the personal folder file and into the email folder you selected. These email messages will now be a part of your email. 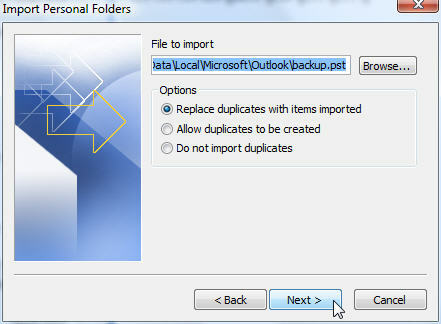 Another option for creating a backup of your email folders is the Auto-Archive feature in Outlook. It is relatively easy to use, and simple to setup. 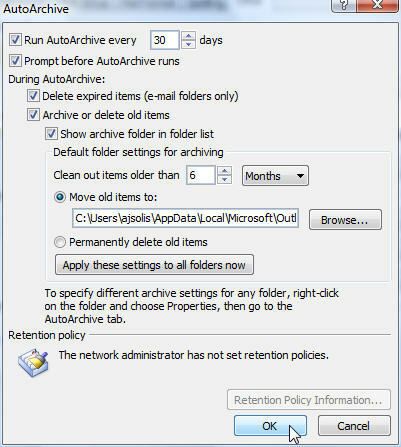 Auto-Archive will automatically move items deemed old (a preference set by you) to an archive file and remove it from your email folder. You have the ability to determine which folders are auto-archived, as well as the time that must pass before an item is deemed old. 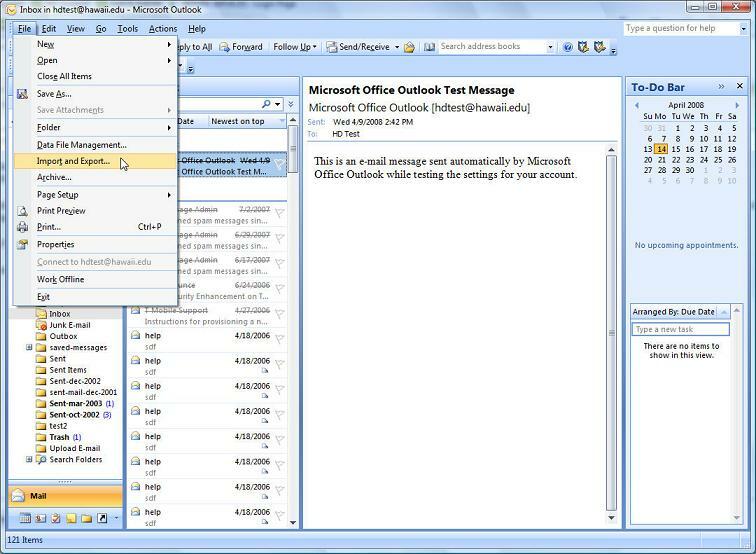 To start the Auto-Archive feature, first launch the MS Outlook application. Then click on the Tools menu, and select Options. In the window that opens, click on the Other tab. Finally, click on the AutoArchive button. In the window that opens, click on the Run AutoArchive every checkbox. Specify the amount of time that must pass for the AutoArchive feature to run. 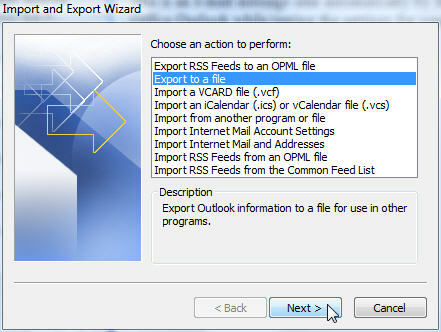 You may also select the option to be prompted by Outlook before the AutoArchive feature is run. Be sure to note down the default archive file location. You may click the Browse button if you wish to change the default file location. Click the OK button to save your settings. Click the OK button on the Options window to return to the Outlook application. You have the power to set the auto-archive options for every folder in your email account. To set the options for a particular folder, Right-click on the folder, and select Properties from the menu. In the Figure below the Inbox was selected. Next, click on the AutoArchive tab. Configure the options as you see fit. You can choose to move the old items to an archive file, or to just delete the items all together. You can also choose the Default Archive Settings or you can have different settings for each folder you decide to archive. Click on the OK button to save your changes. There may come a time in the future when you would like to restore the items in your archived file. You have several options to accomplish this. You can either restore the archived items back into your mailbox (in their original location), you can import the archived items into a new folder, or you can open the archived file, and manually copy over the items you need. 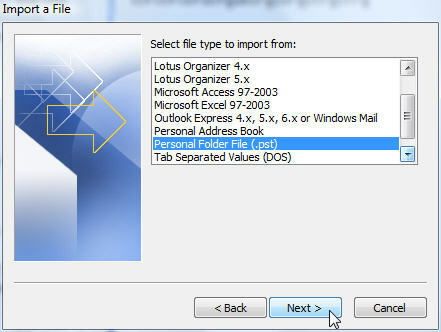 In Outlook, go to the File menu and select Import and Export... In the window that opens, choose the option Import from another program or file. Click on the Next button to continue. Next, click on the Browse button to locate the Archived File you wish to restore your email from. Select the appropriate option for your purposes. Click on the Next button to continue. Next, select the Archive file you want to import from. Be sure to check the Include subfolders check box to ensure you restore all of your email. Then click on the option to Import items into the same folder in: to restore the messages back to their original locations before they were archived. Click on the Finish button to import the email. That’s it. 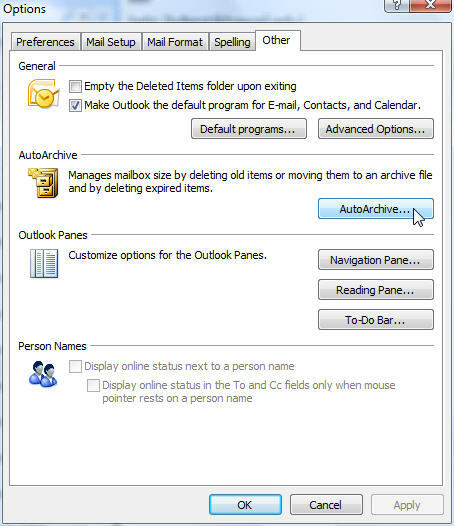 Outlook will import the email messages from the archive file and place them back into their original locations. These email messages will now be a part of your email. Next, give the folder a name. In the Folder contains: text box, choose Mail and Post Items. Then select where you would like to create the new folder. In Figure below, the new folder named Archived Items was created at the root of the hdtest E-mail folder. After creating a new folder to save the archived items in, you are ready to import your archived file. To do this, first click once on the new folder you just created to select it. Then go to the File menu and select Import and Export... In the window that opens, choose the option Import from another program or file. Click on the Next button to continue. Next, select the Archive file you want to import from. Be sure to check the Include subfolders check box to ensure you restore all of your email. Then click on the option to Import items into the current folder to restore the messages into the new folder you created. Click on the Finish button to import the email. That’s it. Outlook will import the email messages from the archive file and place them into the new folder you created. These email messages will now be a part of your email. Then browse to the location of your Archived file. Select it, and click on the Open button. Outlook will then place it in your Folder list. You can then open it, and copy over just the items you wish to move over by simply clicking and dragging the item to the desired location. Alternatively, you can simply view the items while they are in the archived folder. 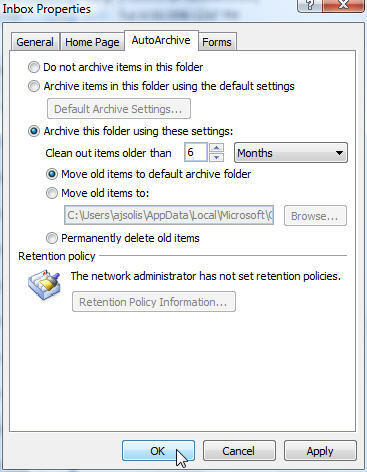 When you are finished with the archived file, you can Right-click on the archived file and click Close “Archive Folders” to remove the archive file from your folder list.